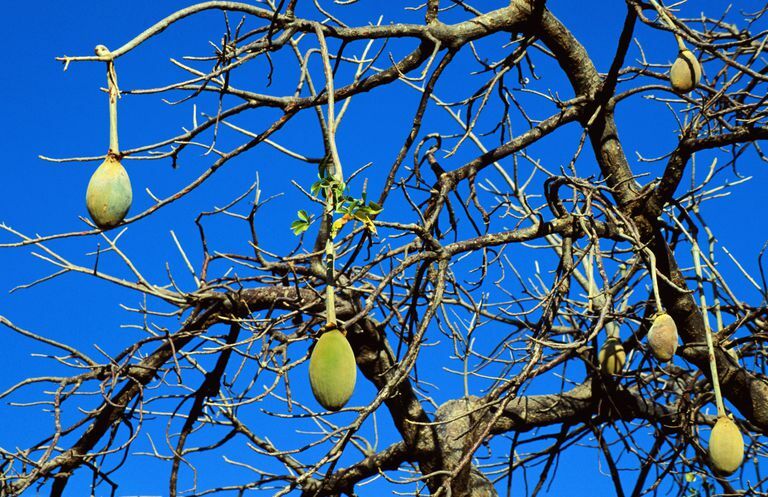 What Are the Health Benefits of Tropical Fruit Baobab? Baobab (Adansonia digitata) is a tree native to certain tropical regions in Africa, including South Africa, Botswana, and Mozambique. Baobab trees produce fruit with a powdery pulp found to contain high amounts of vitamin C. Often consumed as a food or added to beverages, baobab fruit is sometimes used for medicinal purposes. In traditional African medicine, baobab fruit is used to treat a number of illnesses (including asthma, fever, diarrhea, malaria, and smallpox). In addition, practitioners of traditional African medicine often use baobab fruit to curb inflammation. In recent years, manufacturers have begun adding baobab fruit to juices, energy drinks, energy bars and dietary supplements. Often marketed as a "superfruit," baobab is typically touted as a rich source of antioxidants. For instance, baobab is sometimes said to contain greater amounts of vitamin C than oranges and other citrus fruits. Baobab-containing products are often marketed as a rich source of antioxidants. Some proponents claim that, due to their antioxidant content, products made with baobab fruit can help slow the aging process and protect against major illnesses like heart disease and cancer. Baobab is also said to protect against inflammation-related conditions (including type 2 diabetes, arthritis, and allergies, as well as heart disease and cancer). Additionally, baobab fruit is sometimes used as an ingredient in skincare, hair-care and body-care products. Some personal-care products contain baobab oil, which is extracted from the seeds of the baobab tree. Research shows that baobab seeds are rich in essential fatty acids (such as linoleic acid) that may help improve the skin. To date, very few scientific studies have tested the potential health benefits of baobab fruit. The available research includes a 2009 report published in Critical Reviews in Food Science and Nutrition. Looking at data on the nutritional properties of baobab, the report's authors found that baobab fruit is rich in antioxidants, including vitamin C. However, since little is known about how efficiently the human body can absorb the antioxidants found in baobab fruit, the report's authors call for more research on the health effects of consuming baobab. In an earlier report (published in Plant Foods for Human Nutrition in 2004), scientists determined that baobab fruit contains significant amounts of essential minerals (including calcium, potassium, and magnesium). While baobab is generally considered safe, little is known about the safety of long-term use of supplements containing baobab. Keep in mind that supplements haven't been tested for safety and due to the fact that dietary supplements are largely unregulated, the content of some products may differ from what is specified on the product label. Also, the safety of supplements in pregnant women, nursing mothers, children, and those with medical conditions or who are taking medications has not been established. You can get tips on using supplements here. Available for purchase online, products containing baobab are sold in some natural-food stores and in stores specializing in dietary supplements. In addition, personal-care products containing baobab oil are available in some specialty-beauty shops. Due to a lack of supporting research, it's too soon to recommend baobab for any health-related purpose. To increase your intake of antioxidants, try including antioxidant-rich foods like berries, dark, leafy greens and other vibrantly colored fruits and vegetables in your daily diet. If you're considering baobab for a chronic condition, make sure to consult your physician before starting your supplement regimen. Self-treating a chronic condition with baobab and avoiding or delaying standard care may have serious consequences. Chadare FJ, Linnemann AR, Hounhouigan JD, Nout MJ, Van Boekel MA. "Baobab Food Products: a Review on Their Composition and Nutritional Value." Crit Rev Food Sci Nutr. 2009 Mar;49(3):254-74. Osman MA. "Chemical and Nutrient Analysis of Baobab (Adansonia Digitata) Fruit and Seed Protein Solubility." Plant Foods Hum Nutr. 2004 Winter;59(1):29-33. Tal-Dia A, Toure K, Sarr O, Sarr M, Cisse MF, Garnier P, Wone I. "A Baobab Solution for the Prevention and Treatment of Acute Dehydration in Infantile Diarrhea." Dakar Med. 1997;42(1):68-73.